Boomer used to weigh over 300 pounds. He had a history of drug/alcohol abuse, homelessness, had been to jail twice, and had never held a real job. But … that was then and this is now … today, Boomer is a full time Crunch Fitness employee and teaches 3-8 cycle classes a week. He is adulting on the daily, has formed healthy relationships, and is an inspiration to anyone who struggles with anything. Most importantly, Boomer is happy, healthy, and strong!!! Indoor Cycling literally changed his life. Watch and listen as Boomer tells a little bit of his story here ……. 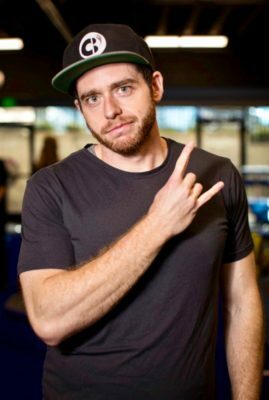 Tonight, Boomer teaches a special and sold out indoor cycling class celebrating his 2 year milestone and it's going to be LIT!!! RockOn, Boomer Rose … ROCK ON!!! Karen is an Instructor and self proclaimed spokesperson for KEEPING IT FUN™ Indoor Cycling. She's also the founder of CB CycleBarn, an Indoor Cycling Studio located in Orange County CA. Karen's classes are upbeat, fun, energetic, and...of course.....intense. She prides herself on keeping her classes innovative, well planned, and unpredictable. The energy Karen brings to every class stems not only from her passion for indoor cycling, but also from the opportunity to help people improve their overall wellness and health.